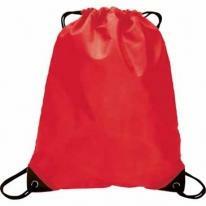 Made Of 80 Gram Non-Woven, Coated Water-Resistant Polypropylene Drawstring Closure Spot Clean/Air Dry Approximate Bag Size: 13" W x 16 1/2" H Imprint Area: 8" W x 9" H. Packaging: 100 per carton @ 15 lbs. 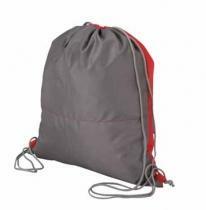 Made Of 210D Polyester Drawstring Closure. Note: Other decorating methods available, please call. Approximate Size: 15" W x 16 1/2" H Imprint Area: 7" W x 9" H Packaging: 200 per carton @ 17 lbs. Often sports and nature go hand-in-hand - the same goes for this great bag! 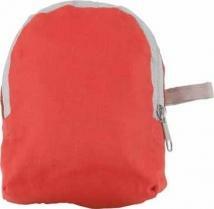 It is eco-friendly and features a drawstring closure and backpack straps. Finish/Material: 80gsm Non-Woven Dimensions: 17" W x 20" Imprint Area: 8" W x 8" H Shipping Information: Carton Size: Box Length: 22.05 Box Width: 18.90 Box Height: 11.81 Standard Packaging: Bulk Packaging Carton Weight: 28 lbs. / 250 pcs. Reinforced corners Double drawcord closure. Size: 14"W x 16.5"H Imprint Area: 9"W x 9"H Product Weight: 24 lbs. per 200. Four Color Process is available, please call for details. Branding is a cinch thanks to this pack's convenient drawstring closure. Its non-woven polypropylene material ensures a budget-friendly promotion. 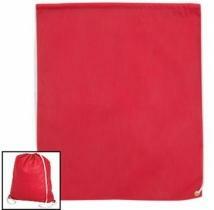 Made of 75-gram, non-woven polypropylene. Size: 13"W x 17"H Standard Print Area: Front / center, 9W x 9H Other decorating methods are available for this item, please call. Packaging: Bulk. Package Quantity: 144 Package Weight: 16 lbs. 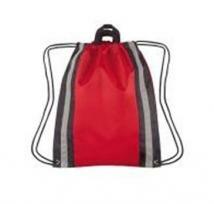 Made Of 210D Polyester Reflective Strip Accents Reinforced Eyelets Web Carrying Handles Drawstring Closure Spot Clean/Air Dry Approximate Bag Size: 16\" W x 20\" H Imprint Area: 6\" W x 9\" H Packaging: 100 per carton @ 20 lbs. Made of 90g recyclable non-woven material, this lightweight, planet-friendly pack is perfect for sports and makes a great giveaway! Size: 14 3/4" x 19"H Imprint Area: On front or back approx. 8" W x 8" H.
Made Of 210D Polyester Large Front Zippered Pocket Built-In Slot For Ear Buds Drawstring Closure Reinforced Eyelets. Note: Other decorating methods available, please call. Approximate Size: 13 1/2" W x 18" H Imprint Area: 7" W x 5" H Packaging: 100 per carton @ 22 lbs. 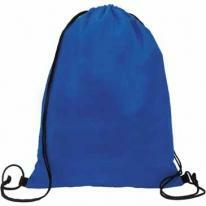 Made Of 210D Nylon Built-In Slot For Ear Buds Large Front Zippered Pocket Drawstring Closure. Note: Other decorating methods available, please call. Approximate Size: 14" W x 18" H Imprint Area: 7" W x 4" H Packaging: 100 per carton @ 22 lbs. Brand new this year! A durable sports pack for an affordable price. 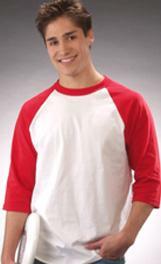 Includes denier nylon and a large logo area for your custom imprint or logo. Perfect for giveaways, tradeshows and conventions. 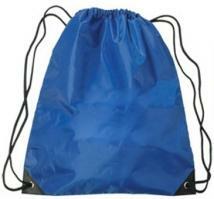 Bags & totes are some of the top promotional products within the industry. They are reusable, easy care, lightweight and often times have a great area for you company logo or information to be imprinted in. 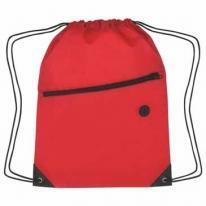 The body of this promotional sports pack is made from a durable denier nylon and includes cords instead of the conventional straps. Select the best product color option and custom imprint color options for your needs from a wide variety of choices. Minimum order: 50. Order blank/unprinted or with your custom imprint. 72-hour rush custom printing option available, pending art and credit approval. Nylon Drawstring Sports Pack Made Of 210 Denier Nylon Construction With Contrasting Simulated Leather Reinforcement Black Trim At The Corners. All Color With Contrasting Black Trim at Bottom Corners. Approximate Bag Size: 17" W x 20" H Imprint Area: 10" W x 10" H Packaging: 100 per carton @ 20 lbs. This handy bag collapses into its own zippered pouch for portable carry space. When expanded, the full-sized sport pack features a convenient front zippered pocket. Made of 210D polyester. Gray drawstring closure. Sport pack collapses into its pocket for compact storage. When expanded, zippered pocket allows for easy access to money, keys and more. Size: 13-1/2W x 16-1/2W (open); 3-1/2W x 4-3/4H x 1-1/2D (closed). Standard Print Area: Outside of pouch (becomes inside of front pocket), 1-1/2W x 2H Optional Print Area: Front / center, 10W x 8H. Other decorating methods are available for this item, please call. Packaging: Bulk Package Quantity: 288 Package Weight: 32 lbs. 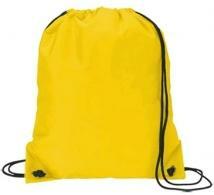 Nylon Drawstring Sports Pack Made Of 210 Denier Nylon Construction With Reinforced Corners. Approximate Bag Size: 13 1/2" W x 18" H Imprint Area: 6" W x 3 1/2" H. Packaging: 100 per carton @ 18 lbs. Note: Other decorating methods available, please call. Catch an eye with color! Far from ordinary, this sport tote won't fail you with its reinforced corners and comfortably thick cord and back pack straps. Finish/Material: 210D Nylon Dimensions: 17" W x 20" H Imprint Area: 10" W x 10" H Shipping Information: Carton Size: Box Length: 20.00 Box Width: 16.00 Box Height: 14.00 Standard Packaging: Bulk Packaging Carton Weight: 35 lbs. / 200 pcs. Mesh top, drawstring closure with backpack straps, reinforced corners. Finish/Material: 210D Poly Dimensions: 14 1/2" W x 18" H Imprint Area: 5" W x 3" H Shipping Information: Carton Size: Box Length: 20 Box Width: 16 Box Height: 14 Standard Packaging: Bulk Packaging Carton Weight: 32 lbs. / 200 pcs. Made Of 600D Polyester Outside Pocket Reinforced Eyelets. Note: Other decorating methods available, please call. Approximate Bag Size: 13 1/2" W x 17" H Imprint Area: 7 1/2" W x 3 3/4" H. Packaging: 50 per carton @ 22 lbs. Durable nylon and grommeted, reinforced corners make for a long-lasting promotion. The Trail Sport Pack's extensive color choices are sure to complement any logo. Made of 210D nylon. Size: 14W x 18H Standard Print Area: Front / center, 9W x 9H Other decorating methods are available for this item, please call. Packaging: Bulk. Package Quantity: 72 Package Weight: 13 lbs. Non-woven Polypropylene. 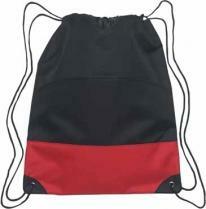 Drawstring closure and shoulder straps. Army duffle styling with outside storage pocket. Fabric Weight: 75 grams. 250 piece minimum on bags. For second side: Add $1.50 plus additional setup for new artwork. Product Proofs: $175.00 Size: 18" x 15" x 3" with 1" x 22" handles Imprint Size: 11" x 7" Shipping Weight: 30 lbs. per carton of 250. You'll love sporting this modern bag! 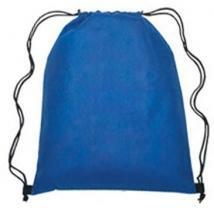 It features a drawstring closure, backpack straps and a fun. Finish/Material: 210D Poly Dimensions: 15" W x 17" H Imprint Area: 8" W x 5" H Shipping Information: Carton Size: Box Length: 17.70 Box Width: 19.70 Box Height: 10.20 Standard Packaging: Bulk Packaging Carton Weight: 45 lbs. / 300 pcs. This tote will look especially good sporting your logo! 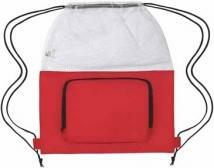 It features a drawstring closure and two exterior mesh pockets. Finish/Material: 210D Poly Dimensions: 17" W x 19 1/2" H Imprint Area: 5" W x 5" H Shipping Information: Carton Size: Box Length: 18.90 Box Width: 11.80 Box Height: 10.60 Standard Packaging: Bulk Packaging Carton Weight: 47 lbs. / 250 pcs. Made from recycled PETG material! Great alternative to polycarbonate. Screw-off lid. BPA Free. Imprint Area: 2-Sided: 2"h x 3"w each side. Wrap: 2"h x 9-1/2"w. Packaging: Individually polybagged. Shipping Weight: 20 Shipping Quantity: 36. 210T polyester. Pull string closure with mesh front pocket, slip front pocket with pen loop. 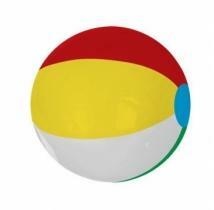 Actual Size: 17-1/2"h x 14"w Imprint Area: 6"h x 6" Other decorating methods are available for this item, please call. Shipping Weight: 17 Shipping Quantity: 200. 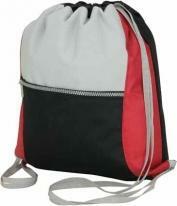 Recycled PET and 210T PET drawstring sport bag with front pocket. A bag worth sporting! 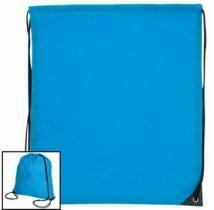 Perfect for the gym, sports field or any adventure, it features a drawstring closure, front pocket, and comes in black, blue and red. Finish/Material: RPET-120gsm, RPET-210T Dimensions: 13 1/2" W x 17 1/2" H Imprint Area: 8" W x 7" H Shipping Information: Carton Size: Box Length: 17.72 Box Width: 15.75 Box Height: 13.78 Carton Weight: 21 lbs. / 100 pcs. 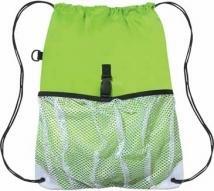 Cost-effective 210D oxford Zippered front pocket with mesh Over a dozen bright and fashion colors. Size: 14W x 16.5H Imprint Area: 7"W x 7.5"H Product Weight: 31 lbs. per 150. Four Color Process is available, please call for details. Made Of 210 Denier Nylon Pull Strap Closure Top Flap With Velcro Closure And Velcro Pocket Built-In Slot For Ear Buds. Note: Other decorating methods available, please call. Approximate Size: 14 1/2" W x 17" H Imprint Area: 3 1/2" W x 3" H Packaging: 100 per carton @ 22 lbs. Perfect for the outdoors! Colorful, durable and water-resistant, the Valley Sport Pack will keep items secure and dry. Made of 70D nylon with water-resistant backing. Size: 14\"W x 18\"H Standard Print Area: Front / center, 9W x 9H AVAILABLE ONLY IN ORANGE AND BLACK. Other decorating methods are available for this item, please call. Packaging: Bulk. Package Quantity: 48 Package Weight: 19 lbs. The Patriot is great for work, school or weekend activities! Its zippered front pocket securely holds pens, jewelry, cell phones and more. 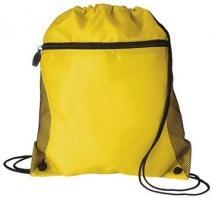 Made of 210D nylon; 600D polyester bottom Zippered front pocket Drawstring closure. Size: 14"W x 18"H Standard Print Area: Pocket, 8W x 5H Other decorating methods are available for this item, please call. Packaging: Bulk. Package Quantity: 48 Package Weight: 16 lbs. 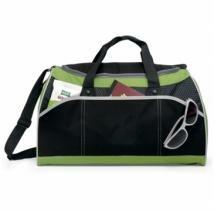 Whether it's soccer balls or beach towels this awesome sports bag is up for the job! 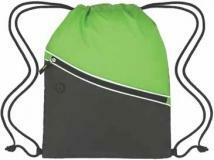 It features a front zip pocket, drawstring closure and backpack straps for easy toting. Finish/Material: 600D Poly, Mesh Dimensions: 14 1/2" W x 17" H x 8 1/2" D Imprint Area: 5 1/2" W x 3" H Shipping Information: Carton Size: Box Length: 21.26 Box Width: 9.45 Box Height: 18.90 Standard Packaging: Bulk Packaging Carton Weight: 34 lbs. / 150 pcs. 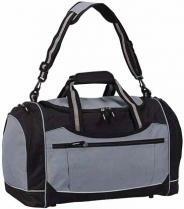 This strong and durable duffel is a great way to carry all your gear and an even better way to promote your brand! 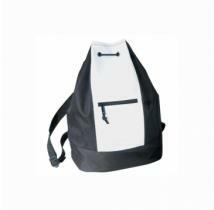 Made of 600D polyester Adjustable shoulder strap. Size: 16W x 9H x 9D Standard Print Area: Front / center, 9W x 5H Optional Print Area: Back / center, 9W x 5H Optional Embroidery Area: Center, 5-1/2 Diam. Other decorating methods are available for this item, please call. Packaging: Bulk. Package Quantity: 48 Package Weight: 34 lbs. 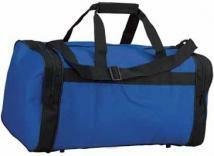 This all-purpose duffel is just right for the gym or park Front pocket with Velcro closure Side pocket for water bottle (bottle not included) Adjustable shoulder straps and top grab handles This product is kid-friendly/CPSIA compliant. Fabric/Material: 600d polyester Size: 18"L x11"H x 9"W Imprint Area: Front pocket center between handles 6"W x 4"H Back panel center 10"W x 5"H Shipping Information: Carton Size: 19"L x 16"H x15"W Quantity: 45 Weight: 32 lbs. Perfect for toting to a sporting event, the gym or anywhere you go! 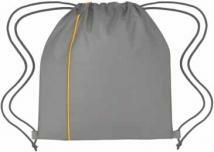 This drawstring sports bag features a front zip pocket with an opening for a headphone wire, a Velcro pocket and backpack straps. Get one in blue or red. Finish/Material: 600D Poly, Dobbie Dimensions: 15" W x 15 3/4" H x 0" D Imprint Area: 6" W x 4" H Other decoration methods are available for this item, please call. Shipping Information: Carton Size: Box Length: 16.54 Box Width: 9.84 Box Height: 11.42 Standard Packaging: Bulk Packaging Carton Weight: 51 lbs. / 150 pcs. 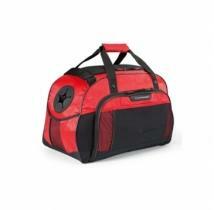 With a variety of color choices, the Sport Roll Bag Collection is perfect for team sports. The Expression provides ample space for practice clothes and equipment while the extra-large design of the Grand makes it perfect for away games and for sports that require loads of equipment. 420D nylon Adjustable shoulder strap. Size: 18W x 10H Standard Print Area: Center, 8W x 7H Optional Print Area: Each end, 6W x 6H Optional Embroidery Area: Center, 5-1/2 Diam. Other decorating methods are available for this item, please call. Packaging: Bulk. Package Quantity: 48 Package Weight: 18 lbs. 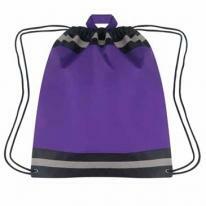 Modern, fun sport bag for the person always on the go! Adjustable shoulder strap and top grab handles Front features 3 pockets for easy to reach items Large main compartment for maximum storage Back panel matches primary bag color Materials: 600d polyester / honeycomb accent Product Dimensions: 18"L x 11"H x 9.75"W Imprint Dimensions: Front pocket center 6"W x 4.5"H, Top lid center 8"W x 4"H Shipping Information: Carton Size: 19"L x 16"H x 15"W Quantity: 45 Weight: 36 lbs. Other decoration methods are available for this item, please call. Made Of 210 Denier Polyester. Adjustable Padded Shoulder Straps And Web Handle. Insulated Lower Compartment With Double Zippered Closure. 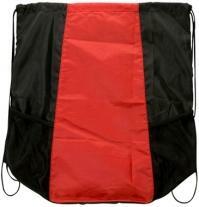 2 Expandable Side Mesh Pockets. Front Pocket. Inside Pocket. 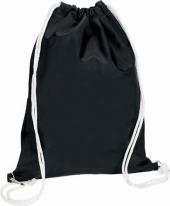 Adjustable Drawstring Closure With Padded Back. Adjustable Protective Top Cover. Note: Other decorating methods available, please call. Approximate Size: 11 1/2" W x 20" H x 7" D Imprint Area: 4" W x 4" H Packaging: 25 per carton @ 18 lbs. Sporty gym bag combines space and style Side mesh pocket for all your essentials Front mesh pockets Adjustable shoulder strap Top grab handles. Fabric/Material: 600d polyester. Size : 19"L x 10.75"H x 9.5"W. Imprint Area: (1) Front pocket center 5.5" W x 4" H (2) Top lid center 7" W x 4" H. Shipping Information: Carton Size: 19" L x 16" H x 15" W Quantity: 25 Weight: 29 lbs. Other decoration methods are available for this item, please call. Side mesh pockets for accessories and water bottle. Spacious main zippered compartment. Front zippered pocket secures personal effects. Adjustable non-detachable shoulder strap. Dobby Nylon/600D Polyester. Product Size (H x W x D): 12.00 x 18.00 x 10.00 Imprint Area: Front Pocket 3 1/2"h x 4 1/4"w Packaging: Bulk Pieces Per Box: 25 Weight Per Piece: 1.31 lbs. Weight Per Box: 32.75 lbs. Case Dimensions (L x W x H): 20 x 13 x 17. 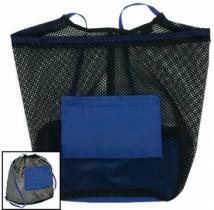 Side ventilated shoe pocket, front zippered pocket, one "hideaway" zippered mesh beverage holder and one side utility mesh pocket. 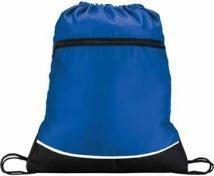 Combines 600D Polyester with 420D Dobby, large zippered main compartment. Includes adjustable shoulder strap and carry handle. Product Size (H x W x D): 11.00 x 20.00 x 9.00 Imprint Area: Front Pocket 2 1/2"h x 5"w Packaging: Polybag Pieces Per Box: 50 Weight Per Piece: 1.10 lbs. Weight Per Box: 55 lbs. Case Dimensions (L x W x H): 21 x 13 x 18. Fashion double walled stainless steel tumbler, Exciting patterned decoration that will excite all who receive it, 2 colour stories for different client needs Easy grip tumbler. Size : 3.25"w x 7"h Imprint Area: (either side) 2 1/2� x 1 1/8� (wrap) 6 1/2� x 1 1/8� Other decoration methods are available for this item, please call for details. WT/PC: 20 lbs./24 units (master carton) PACKAGING: Individually boxed. The next generation of a best seller, this sport bag features a range of color options. Efficient double pocket styling Handy water bottle pocket (bottle not included) Colorful contrast accents Adjustable shoulder strap. Fabric/Material: 600d polyester. Size : 18"L x 10.5"H x 9"W. Imprint Area: (1) Front right pocket center 4"W x 4"H (2) Front left pocket center 4"W x 4"H (3) Back pocket center 12"W x 5"H. Shipping Information: Carton Size: 19"L x 16"H x 15"W Quantity: 20 Weight: 28 lbs. Other decoration methods are available for this item, please call. 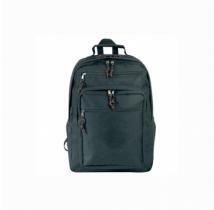 Two full zipper compartments, top handle, side mesh pockets, earphone port Material: 600 Denier w/Doby Nylon Product Dimensions: 18-1/2"H x 13"W x 6-1/4"D Imprint Dimensions: Pocket: 5"H x 5"W Extra color/position imprint add $55.00 /set up, plus running charge of $0.70 per piece. Units/Weight Per Carton: 20 pcs/16 lbs. 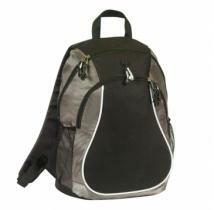 Detachable, adjustable shoulder strap with metal hardware and padded, non-slip comfort guard. 600D Polyester. Outside mesh beverage pocket. 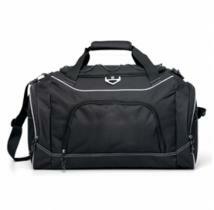 Roomy top compartment and ventilated bottom compartment, both with 2 sided zippers. Smaller front pocket with zipper for small personal accessories. Product Size (H x W x D): 9.50 x 22.00 x 10.00 Imprint Area: Front Pocket x 2"h x 3 1/2"w Packaging: Bulk Pieces Per Box: 15 Weight Per Piece: 1.67 lbs. Weight Per Box: 25 lbs. Case Dimensions (L x W x H): 18 x 13 x 14. Send your logo anywhere and everywhere on this roomy, sturdy duffel. Zippered end compartments keep shoes separate and provide easy access to the essentials. 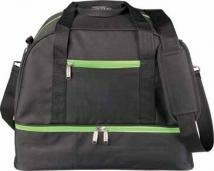 Made of 600D polyester Front zippered pocket 2 easy access, zippered end compartments Adjustable shoulder strap. Size: 22W x 10H x 10-1/2D Standard Print Area: Front / center, 10W x 6H Optional Print Area: Back / center, 10W x 6H Optional Embroidery Area: Center, 5-1/2 Diam. Other decorating methods are available for this item, please call. Packaging: Bulk. Package Quantity: 24 Package Weight: 36 lbs. 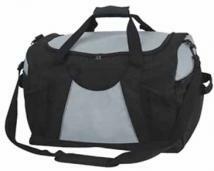 Sporty gym bag keeps you organized on the run Generous sized front pocket Top grab handles Adjustable, removable shoulder strap Side cinch mesh pocket End shoe tunnel. Fabric/Material: 600d polyester. Size : 20.5"L x 12.5"H x 9"W. Imprint Area: (1) Front pocket center 5.5" W x 4.5" H (2) Top lid center 8" W x 4" H. Shipping Information: Carton Size: 24"L x 17"H x 16"W Quantity: 20 Weight: 27 lbs. Other decoration methods are available for this item, please call. 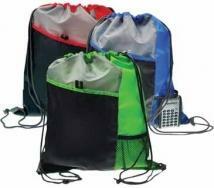 With a variety of color choices, the Sport Roll Bag Collection is perfect for team sports. The Expression provides ample space for practice clothes and equipment while the extra-large design of the Grand makes it perfect for away games and for sports that require loads of equipment. 420D nylon Adjustable shoulder strap. Size: 30W x 14H Standard Print Area: Center, 6W x 6H Optional Print Area: Each end, 9W x 9H Optional Embroidery Area: Center, 5-1/2 Diam. Other decorating methods are available for this item, please call. Packaging: Bulk. Package Quantity: 24 Package Weight: 15 lbs. Durable, rugged sport bag features top bungee cord for extra storage Adjustable, removable shoulder strap and top grab handles with handle wrap Zippered side pocket with mesh for water bottle (water bottle not included) and grab handle Zippered side pocket with grab handle Large main compartment for spacious storage and removable floor board for extra durability Front zippered gusset pocket Tri ring for keys Back panel of bag is black Materials: 600d polyester Product Dimensions: 19.5"L x 11"H x 11.75"W Imprint Dimensions: Front pocket center 7.5" W x 4.5" H Shipping Information: Carton Size: 19" L x 16" H x 15" W Quantity: 20 Weight: 32 lbs. Other decoration methods are available for this item, please call. With this updated version of our popular Ultimate Sport Bag, getting to the gym never looked this good Exterior molded insulated bottle holder for easy access (bottle not included) Spacious main compartment Adjustable shoulder strap and top grab handles Front and side pockets for storage with integrated mesh for ventilation Dual branding opportunity with Logomagic decoration Exclusive patented product Removable floor board Back panel of each bag is black Materials: 420d polyester / 600d polyester Dimensions: 18.25"L 12"H 10"W Carton Size: 19"L 16"H 15"W Quantity: 20 Weight: 34 lbs. Zippered side meshed pocket. Zippered side gusseted pocket. Airflow cushioned back and adjustable S-shaped shoulder straps. Zippered front pocket with accessory organizer. MP3 pocket with earphone outlet. Large main zippered compartment with document pocket. 600D Polyester/420D Ripstop Nylon/Dobby Nylon. Product Size (H x W x D): 19.00 x 11.50 x 5.50 Imprint Area: Top Pocket 2 1/2"h x 4"w Packaging: Polybag Pieces Per Box: 20 Weight Per Piece: 1.10 lbs. Weight Per Box: 22 lbs. Case Dimensions (L x W x H): 19 x 14 x 19. Front zippered pocket. 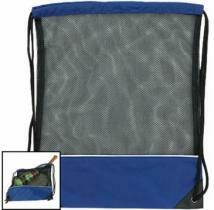 Large main zippered compartment with plastic base for additional support. Zippered side accessory pocket. 600D Polyester with reflective trim. Zippered MP3 pocket with earphone outlet. Detachable, adjustable shoulder strap with non-slip guard. Zippered ventilated side shoe compartment. External molded protective feet. Product Size (H x W x D): 12.00 x 23.00 x 12.50 Imprint Area: Lower Front Pocket 2"h x 5"w Packaging: Polybag Pieces Per Box: 15 Weight Per Piece: 1.60 lbs. Weight Per Box: 24 lbs. Case Dimensions (L x W x H): 24 x 13 x 17. 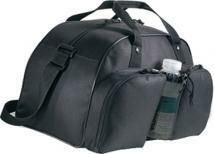 600D Polycanvas duffel with zippered main compartment. 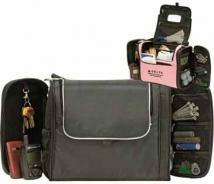 Multiple compartments inside and outside bag. Lightweight and great for travel. Sturdy handles with grip cover and adjustable shoulder strap with shoulder pad. Product Size: 12�H x 20-1/2�W x 13� Imprint Area: Heat transfer/Sublimation: 4"H x 4"W / Embroidery 3"Diam Note: Other Decoration methods are available, please call for details. Other decorating method is available for this item, please call. Weight: 10 pcs./ 19 lbs. Spacious main zippered compartment. Side mesh beverage/accessory pocket. Adjustable detachable shoulder strap. Front zippered accessory pocket secures personal effects with MP3 pocket with earphone outlet. Zippered ventilated side shoe compartment. Dobby Nylon/mesh. Product Size (H x W x D): 12.00 x 22.00 x 10.00 Imprint Area: Front Pocket 2"h x 4 1/2"w Packaging: Bulk Pieces Per Box: 10 Weight Per Piece: 2.10 lbs. Weight Per Box: 21 lbs. Case Dimensions (L x W x H): 23 x 14 x 10. Pack what you need for the day! 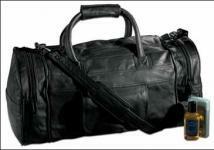 The heavy-duty Harrison Travel Duffel goes the distance. A rounded, modern design will beautifully showcase any logo. Made of 600D polyester Zippered front pocket 2 easy access zippered end compartments Adjustable/detachable, non-slip shoulder strap. Size: 24W x 12-1/2H x 10D Standard Print Area: Pocket, 6W x 3-1/2H Optional Print Area: Back, 10W x 7H Optional Embroidery Area: Pocket, 3-1/4 Diam. Other decorating methods are available for this item, please call. Packaging: Bulk. Package Quantity: 12 Package Weight: 24 lbs. This rugged, durable duffel works as hard as you do with style that takes you anywhere. Front pocket easily stores yoga mat (not included), umbrella or other sport necessities. Unique dual decoration location built right into the bag. Padded, removable and adjustable shoulder strap. Front mesh pockets. Fabric/Material: 420d dobby / 600d polyester Size: 22"L x 13"H x 11"W Imprint Area: Front pocket center 5.5W 4H Top flap center 8"W x 4.5"H Shipping Information: Carton Size: 24"L x17"H x16"W Quantity: 15 Weight: 30 lbs. With a ventilated end shoe pocket, rubberized PVC bottom and water-resistant material, the Hatteras is the perfect gym bag. Made of 420D nylon with water-resistant with rubberized PVC bottom. 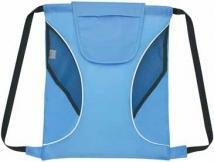 Water bottle pocket (sport bottle not included) Adjustable / detachable, non-slip shoulder strap. Size: 23-1/4W x 11-1/4H x 11-1/4D Standard Print Area: Center, 9W x 3H Optional Print Area: Back, 5W x 4 Optional Embroidery Area: Center, 4-1/2 Diam. Other decorating methods are available for this item, please call. Packaging: Bulk. Package Quantity: 12 Package Weight: 36 lbs. A great companion to the Vertex Sport with its rugged and durable go-anywhere capability. Front pocket unbuckles to store yoga mat (not included), umbrella or other necessities. Unique dual decoration location built right into the bag. Front mesh pockets. Padded, removable shoulder strap. Shoe tunnel. Fabric/Material: 420d dobby / 600d polyester Size: 26"L x14.5"H x12"W Imprint Area: Front pocket center 7"W x 4.5"H Top flap center 9"W x 5"H Shipping Information: Carton Size: 24"L x17"H x16"W Quantity: 15 Weight: 39 lbs. Get organized like a pro with our lightweight, compact golf cart tote. Room for all your golf necessities - tees, balls, markers, gloves, towels. Pockets for personal items like keys, phone, sunglasses, wallet, sunscreen, lip balm, comb and bandages, you ll never be caught on the course unprepared again. Magnetic closure makes the tote easy to access while on the go. Made of sturdy polyester with poly fleece lining. Monogramming is also available for only $5.00 per piece, including up to 3 initials. Actual Size: 10.5" W x 14" H x 5" D Imprint Area: 3-1/2" H x 3-1/2" W center front flap 1-1/2" from bottom Packaging: Bulk Shipping Weight: Approx. 3 lbs. per piece. Made Of 110 Gram, Non-Woven, Coated Water-Resistant Polypropylene. Carrying Handles. Reinforced Eyelets. Drawstring Closure. Approximate Size: 17" W x 20" H Imprint Area: 9" W x 9" H. Packaging: 100 per carton @ 19 lbs.